"Human beings have developed cheating, fraud, and trickery into such a high art (or, more accurately, a low one) that, in English at least, we’ve created an extensive and colorful vocabulary to describe such activity. Here is an exhaustive but incomplete list of synonyms in noun and/or verb form for cheat, fraud, and trickery." "Many words related to deceptive and fake exist, but some have specific senses for distinctive usage. Here are some alternatives to these terms and the related words deceitful and false and their connotations..."
especially, an employee or former employee who reports a violation by an employer. "Forget body language or eye movements. There are much better ways to identify the deceitful." "Propaganda has a bad name. It is what repressive regimes use to glorify their leaders, motivate their citizens and demonise their enemies. It is about lies and distortion, manipulation and misrepresentation." "Most parents tell lies to their children as a tactic to change their behaviour, suggests a study of families in the United States and China." Will we ever... create a perfect lie detector? "To create machines that can always tell when someone is lying, we need to know much more about what goes on in our brains. In The Truth Machine, a science-fiction novel published in 1996, scientists invent a device that can detect lies with perfect accuracy. It abolishes crime, changes the world, and generally saves humanity from self-destruction..."
"Women lie about their looks whilst men lie about their jobs in the battle to find a partner through internet dating, a survey has found." Mums are the people mostly likely to be lied to." "A US sheriff has said the case of six-year-old Falcon Heene who was believed to be adrift in a helium balloon, prompting a major alert, was a hoax." "US vice-presidential hopeful Sarah Palin has become the victim of a prank phone call by a Canadian comedian posing as the French president." Today, they are into electronics, they are into medicine, they are into food." "What is the best way to catch someone in a lie? Traditional thinking would have us believe that watching body language and facial expressions work well. But a new study shows something quite different. This story has some great expressions about lying. And that is no lie." "Fibs. Stretch the truth. Exaggerate. Make things up. Half-truths. Bend the truth. Outright lies. And out-and-out, barefaced or bold-faced lies. To be tangled in a web of one’s own lies … is no place to be." "How good are you at spotting if someone is 'telling a porky'? Practise the vocabulary you learn in the programme with the table of phrases" and an interactive quiz. "We hear anywhere from 10 to 200 lies a day. And we’ve spent much of our history coming up with ways to detect them, from medieval torture devices to polygraphs, blood pressure and breathing monitors, voice stress analyzers, eye trackers, infrared brain scanners, and even the 400-pound electroencephalogram.."
"Police in Colorado, USA, are to charge a man who started a massive emergency rescue operation for his son. It seems the search may have been nothing more than a publicity stunt..."
"Students complete a tutorial on Web literacy and use what they learn to determine the reliability of Web site content." The Other Side of Truth "is a children's novel about Nigerian political refugees by Beverley Naidoo, published in 2000. A powerful story about justice and freedom of speech, it received several awards including the Carnegie Medal. The novel is set in the autumn of 1995 during the reign of the despot General Abacha who is waging a campaign of suppression against journalists. A Nigerian girl and her younger brother have to leave Nigeria suddenly when their mother is killed during an assassination attempt on their outspoken journalist father. They are abandoned in London and have to cope with the police, social services and school bullies." "Tell a lie, play with fire. But don’t complain about the smoke!" "A liar is a liar, clothes or no clothes. 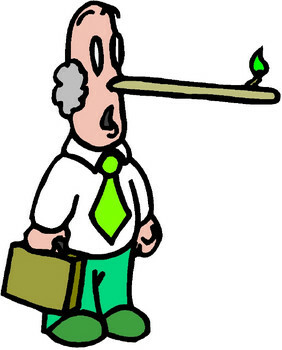 A liar is a liar and lives on the lies he tells and dies in a life of lies." I know the real story! Torture ? What torture ? But Fletcher has a habit of giving precedence to his job, breaking promises to Max and his ex-wife Audrey (Maura Tierney), and then lying about the reasons. Fletcher's compulsive lying has also built him a reputation as one of the best defense lawyers in the state of California as he is climbing the ladder in the firm he is working for..."
"Fletcher Reede (Jim Carrey) is a lawyer obsessed with his career, and he's devoted his life to bending the truth to his advantage..."
Body of lies "is a 2008 American spy film based on the novel of the same name by David Ignatius set in context of the Middle East and the war on terror, unfolding the story of three men battling a terrorist organization, and each other. - Adaptation of an Oscar Wilde play. "Goring... finds himself caught up in a tangled web of lies, temptations, and trysts. "is an American television series that originally ran on the Fox network from January 21, 2009 to January 31, 2011. Based on the real-life scientific discoveries of Paul Ekman, the series follows Lightman and his team of deception experts as they assist law enforcement and government agencies to expose the truth behind the lies "
But a new study shows something quite different." "Exposing the truth about our corrupt world. My name is Spencer Cathcart and this is a short film I made & wrote." "A little girl loves her daddy dearly, and admires him, too. Still, she knows more about her daddy than he realizes. She know he’s a liar. It looks like the ad agency that does those Thai Life Insurance ads got hired to produce this one for MetLife Hong Kong. Better grab your hanky." "With a sea of information coming at us from all directions, how do we sift out the misinformation and bogus claims, and get to the truth? Michael Shermer of Skeptic Magazine lays out a "Baloney Detection Kit," ten questions we should ask when encountering a claim. 1. How reliable is the source of the claim? 2.Does the source make similar claims? 3. Have the claims been verified by somebody else? 4. Does this fit with the way the world works? 5. Has anyone tried to disprove the claim? 6. Where does the preponderance of evidence point? 7. Is the claimant playing by the rules of science? 8. Is the claimant providing positive evidence? 9. Does the new theory account for as many phenomena as the old theory? 10. Are personal beliefs driving the claim?" "Un documentaire qui expose ce qui s'est réellement passé le 11 septembre 2001." But you deny, you ever lied..."
'cause all I do is mess you up and lie to you"
Probably coz my lies just started getting deeper..."
"Honesty is such a lonely word. to tell me pretty lies. All I want is someone to believe..."
It could never be, the way it was before"
"Tell the truth. Tell me who's been fooling you? You know I wouldn't tell you no lies." "Would I lie to you honey? Tell you straight - no intervention. To your face - no deception."